Oh my dear readers…I haven’t abandoned you, no! There hasn’t been a single day since my last post that I haven’t thought about you. My new job has been taking all of my time. I haven’t had any time for myself at all. I’ve just been cooking basics, repeating the dishes over and over again every week. Hhhhh! I spend 3 hours a day in commuting to and from work everyday and I am considering of moving closer to my workplace now as I think I’ll be working there longer than I expected, which is good! Very good indeed! I like the job! The only new food I’ve tried lately is jaggery (also called goor or gur). You most probably have seen this on other blogs. It is very popular in sweet Indian dishes, desserts, cakes. It is an unrefined sugar made from sugarcane; it is also known as the medicinal sugar and can be used to treat lung and throat infections (more on Wikipedia). I wonder why I’ve never seen this in Mauritius where they make sugar from sugarcane. Although, I kind of remember seeing something like it a long time ago while I was still little. But anyway, I had never had it before and have seen it in Indian shops over here in Dublin. So, I decided to give it a try after having read a lot of good things about it on sites/blogs that I haven’t bookmarked (oops!) and how they manufacture it (on this blog). This form of unrefined (therefore healthier) sugar is much tastier than brown or demerara sugar; so delicious and fudgy that I’m founding myself eating chunks of it like a little sweet treat instead of chocolate! 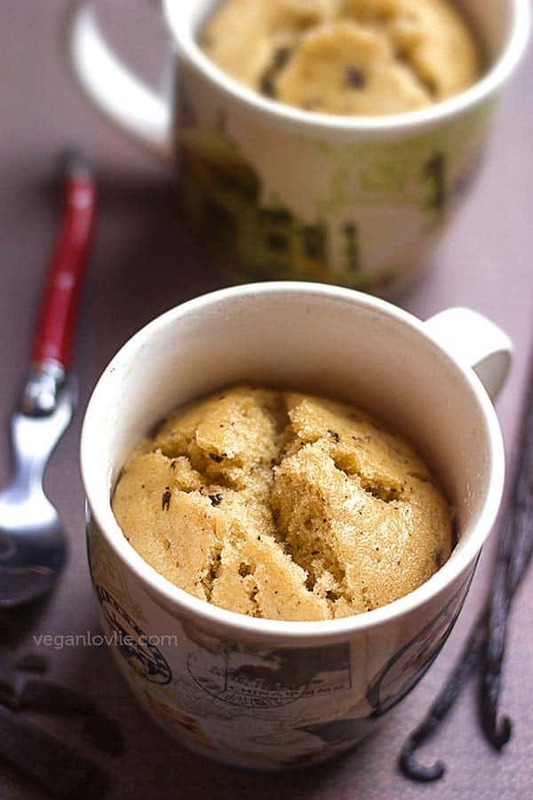 Jaggery is like a little indulgence by itself! 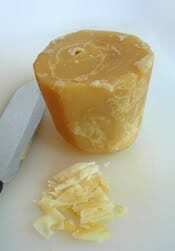 Jaggery can be grated, sliced or crushed then used as normal sugar in cakes, desserts or even beverages. I am pretty excited to try a lot of recipes using this magical sugar, if I may say! 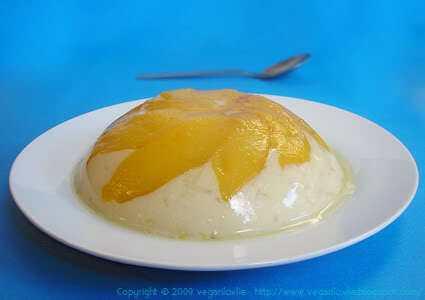 For my first recipe, I made this jelly with rice water and mango pieces. Rice water? I don’t own a rice cooker. In consequence, I pour off the excess water from the rice after boiling. I feel quite guilty chucking away all this nutritious rice water, so I’ve decided to start saving it for other uses like soups, thickening sauces. Well, I decided to make this jelly using this water and some agar agar flakes. The recipe is very simple, although I don’t exactly know how to measure the agar agar flakes. I bought them at the Chinese store over here and they come in long strips. I just hold the whole bunch of strips and cut off about 2-3 cm or 1 inch. If I were to scrunch the strips up, I think they might fit in something like 2 levelled tablespoons. Well, you’ll have to experiment a bit to get the right consistency and they will never be the same anyway as it’s almost impossible to get the exact amount of agar agar every time (except if you use the powdered one). 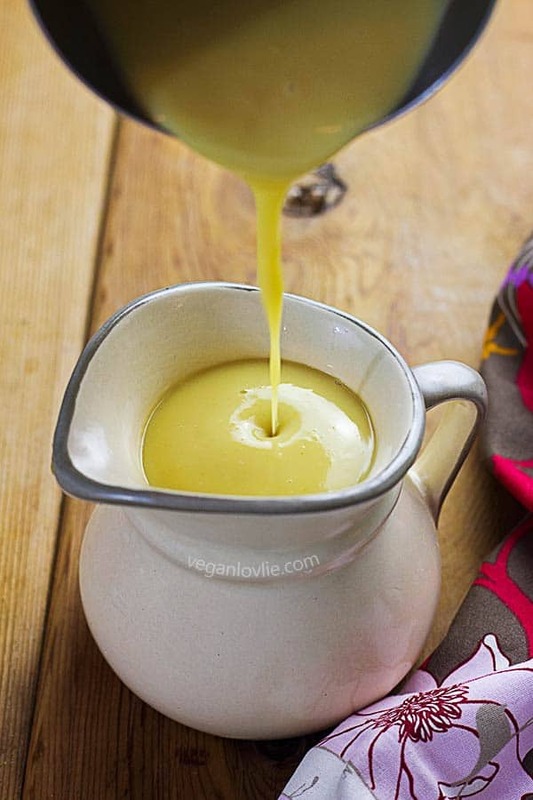 Place mango pieces in a non-stick pan with 2 tablespoons jaggery. Cook for a few minutes until jaggery is melted and mango is slightly softer. Remove from heat and arrange in a bowl/dish. Place water in a saucepan with agar agar flakes. Boil until agar agar flakes are well dissolved. Add all remaining ingredients and bring to the boil. Remove from heat as soon as liquid reaches the first boil and pour over mangoes in dish. Allow to cool and set in a quiet place. Place in refrigerator for at least 2 hours (or until firm) before turning over and serving. I would never think to use rice water in making a jelly, but this looks so delicious and pretty! Thanks for sharing your recipe! I’ve never heard of this before…how interesting. 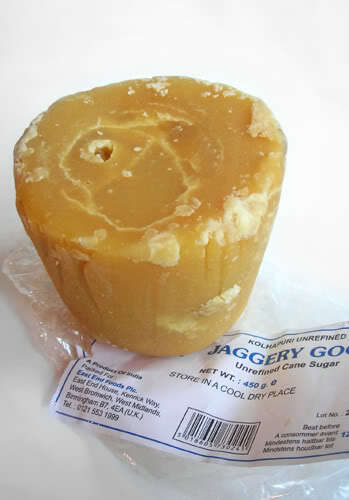 wow jaggery looks exciting…i’ve never heard of it before and now i’m really curious! Sorry to hear that work has been so all-encompassing (three HOURS?? )–but glad that you like it, anyway! And the jaggery sounds very interesting, too–I’ve heard of it but never actually seen it. Great-looking recipe! ack, three hour commute–i’m so sorry. wow, maybe i will try to find this at an indian market…that’s awesome that you can substitute it for other dry sugars. welcome back,glad to see youre ok..
Yes,jaggery is definitely wonderful,I use it in almost anything I need sweetened!But I dont allways find some fresh(make sure you find it in a light color,as in ‘Ayurveda-the darker ones are said to be older and become somewhat unhealthy)..lovely refreshing desert,a beautiful sign for spring being just around the corner..! oh and thanx so much for that link showing the process of preparing the jaggery!Beautiful and very interesting! I’ve never tasted jaggery but I’ve seen it on Cuisine TV in an indian cuisine show. I think they melted it to use it in a dessert if I’m not mistaken. That dessert looks so pretty and inviting. I’ll look for the jaggery- never heard of it before- thanks for the education! 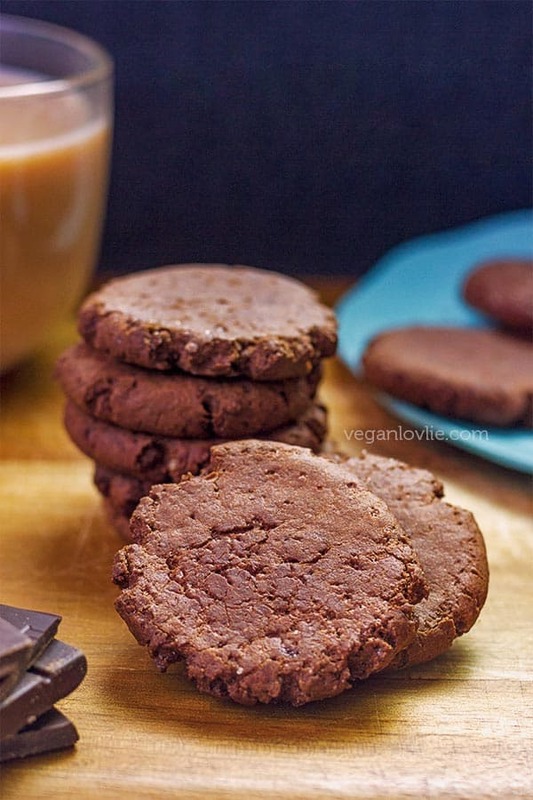 I’ve heard of jaggery before, but wasn’t really sure how to use it – now that I have a recipe to try I need to try and track some down! I love reading your blog. I always learn something new from you. Glad you like the job! That is such a beautiful pudding!! Love it! There you are! It’s nice to see you. And YUM! I love your pudding, it’s so pretty! I’m so glad you wrote this post about jaggery. I have wanted to experiment with it. For some reason I thought it may not be as sweet as granulated sugar, but now that I think about it, Indian sweets seem terribly sweet to me. aTxVegn: Jaggery is the same sweetness as granulated sugar, I think it might be slightly sweeter even. I’m totally in love with it although it’s a bit more expensive than sugar over here. Thank you for the link to one of my posts! This is an interesting recipe! Never would have thought of using the nutrients in rice water! Lovely Blog! Thanks for sharing.. I do that all the time when I cook with jaggery, just have a few bits of jaggery especially if it is soft it kind of melts on the tongue, yum! I love jaggery! Mango jelly looks so tasty! Oh cool! I have some jaggery & have been trying to decide what to do with it!